It’s the last few days of school for many high schoolers, and college students have already started their summer break. Time to look for a summer job? Or maybe not. According to information from our Current Population Survey, fewer than half (43.2 percent) of teenagers ages 16–19 participated in the labor force in July 2016, meaning they either worked or were actively looking for work. This is a sharp contrast from my own summer experience 40 years earlier, when I was either looking for opportunities to get out of the house and make some money, or it was made clear by my mom and dad that I wouldn’t be sitting around the house all summer. 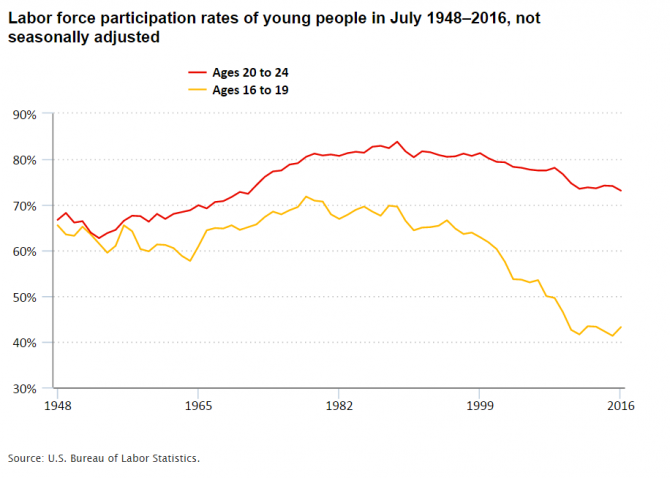 Apparently my experience wasn’t unique, as the labor force participation rate among 16–19 year-olds in July 1978 was 71.8 percent. Yes, kids worked in the summer. And what were we doing? You name it. My buddy down the street delivered newspapers, winter and summer. You may have heard of a newspaper; it’s kind of like printing the entire Internet every day on grey paper. And it was typically delivered by kids on bicycles—twice a day where I grew up. My father enjoyed the afternoon newspaper and an adult beverage when he came home from work every day. Afternoon newspapers included partial box scores for day baseball games, as well as noon stock prices from Wall Street. And the newspaper was the source of my first summer job. Every summer, the local newspaper would let kids place free want ads. You may have heard of want ads; it’s kind of like Craigslist on grey paper. Kids would advertise to babysit, do chores, mow the lawn, or any other kind of service. My jack-of-all-trades ad got me several jobs helping older folks clean out basements, attics, and assorted other overgrown spaces. It was hard work; I definitely earned my pay. I worked at the local cheese factory one summer, or should I say part of the summer. The smell wasn’t very pleasant. I spent several summers as a cafeteria worker, mostly working the cash register but occasionally serving food as well. A key skill needed to keep the cafeteria line moving was the ability to make change. In those days, the cash register didn’t tell you how much change to provide. In fact, at the end of each shift I had to reconcile my till against the day’s receipts. I quickly learned to provide the proper change lest I had to dig it out of my own pocket. And under the heading of “employee benefits,” I got free lunch every day, including ice cream. And then there were the psych experiments. I lived near a university that was always looking for “subjects” for their experiments. They were mostly cognitive activities, like grouping items into categories. Only occasionally were there wires attached to my head. These activities might be considered an early version of a gig job, as they were typically scheduled at random times and always paid in cash. (There was no Venmo back then.) And yes, I reported every dime on my tax return. I suspect summer jobs have changed over the years. I hear of kids getting internships to build skills and advance their future careers. And many students are spending their summers in school, or practicing sports, or in specialized programs to build skills, like computer programming. 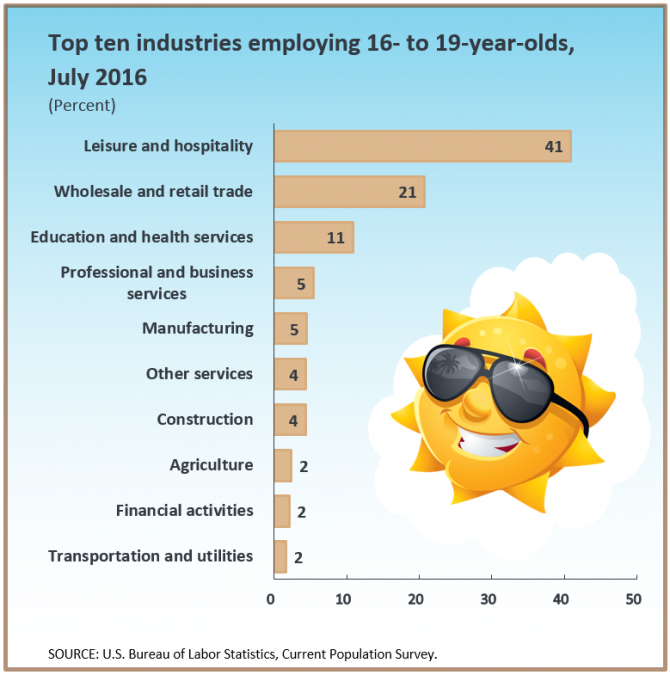 Every year, the Bureau of Labor Statistics releases a special report on youth employment. We will release the 2017 report on August 16.